I’ve spent a lot of time on Western Michigan University’s campus this week. There’s been a lot going on and a lot of work for my company. I spent most of the day Friday at WMU and even though it’s close enough for me to go home on my dinner break, I decided to seek out some of the new places around campus. I’ve tried a couple times now to go to Fifth Avenue which replaced AFB Bar & Grill, but they don’t open until 5:00 (even though their website and Facebook say 11:30) so I’ve failed on both attempts. 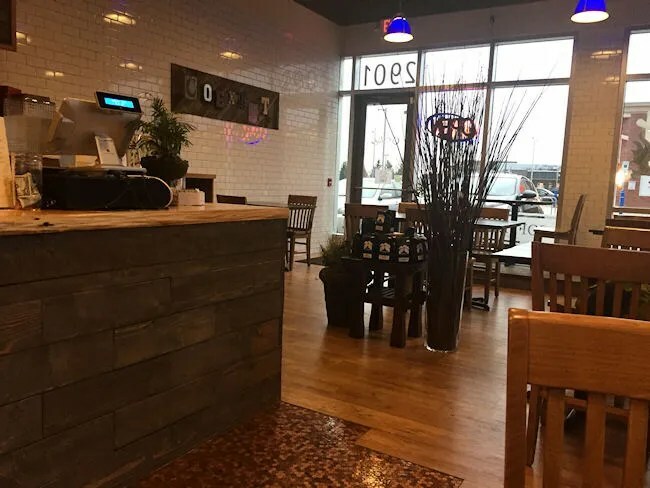 While driving through Campus Pointe Mall at the corner of Howard and West Michigan, likely on my way to Wendy’s, I noticed another long empty storefront was filled with another new coffee shop. I couldn’t find a food menu online, but I figured it had to be better than Wendy’s so I parked my car and took my chances there instead. 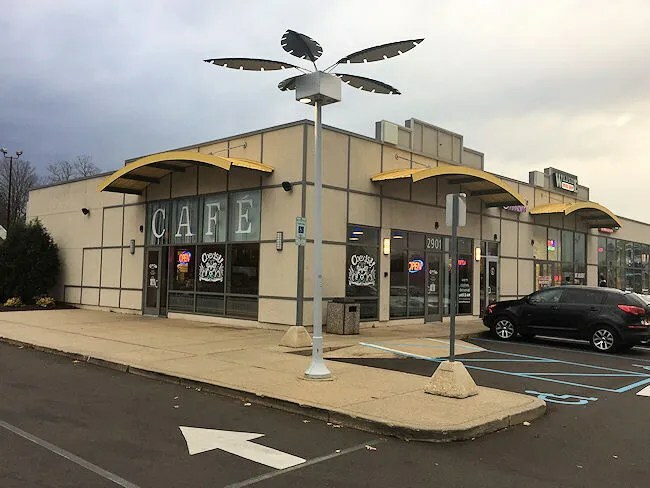 Coexist Cafe opened up at the beginning of the summer in the corner space of the Campus Pointe Mall that has housed a couple of burger shops in recent memory. 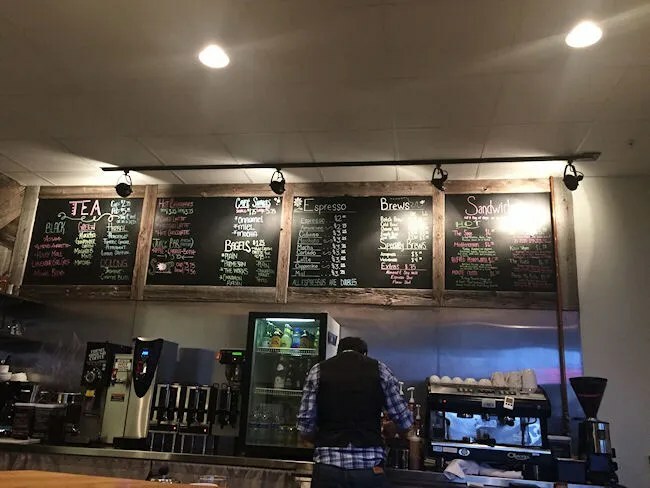 Both Real Deal: Classic Burgers and Shakes and Sliders Burgers and Belgian Fries haven’t been able to make the location work, but Coexist has totally revamped the space to a point it would be unrecognizable to patrons of the two previous businesses. I stopped in for a quick dinner at around 4:00 on a Friday afternoon. There’s plenty of parking around the building in the massive lot of the strip mall. The cafe did a total redesign of the space making it feel much more intimate than the wide open space of the burger joint. 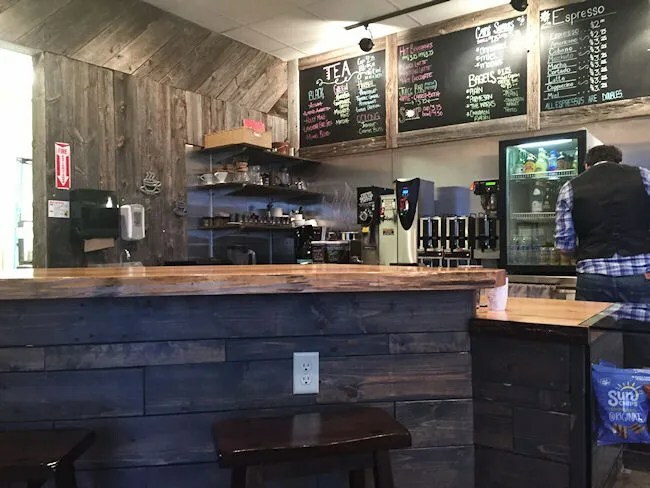 They put in a wood floor in the seating area, went with solid wood chairs, and put in some comfortable, muted tones by the way of faux plants and bookshelves to give it that homey feeling of a coffee shop. Mini-rant over. The order counter doubles as a bar that you can slide up to and sip your coffee while working if you don’t want to take up a table. It has some very cool wood paneling, solid wood bar stools and even a couple plugs to provide power for your devices. 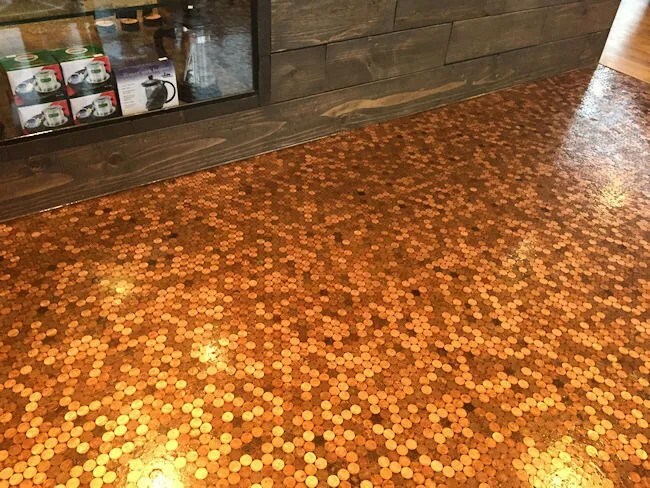 The floor in this area is made from pennies laid edge to edge then covered. It’s kind of a cool look that I’ve seen bars do before, but never as a floor. I started my order with a small hot chocolate. I had to get some kind of drink and tea or coffee don’t really do it for me. I honestly was just expecting a glass of delicious chocolate, but even this gets the barista’s touch with a foam flower on the top. He handed it to me without a lid so I could appreciate his work…and I did. I’m always amazed at how baristas are able to draw in drinks like that. There were lids at the self serve coffee counter around the corner so I grabbed one of those before I left so I didn’t spill on myself. The hot chocolate was quite delicious even if it wasn’t a really cold day. 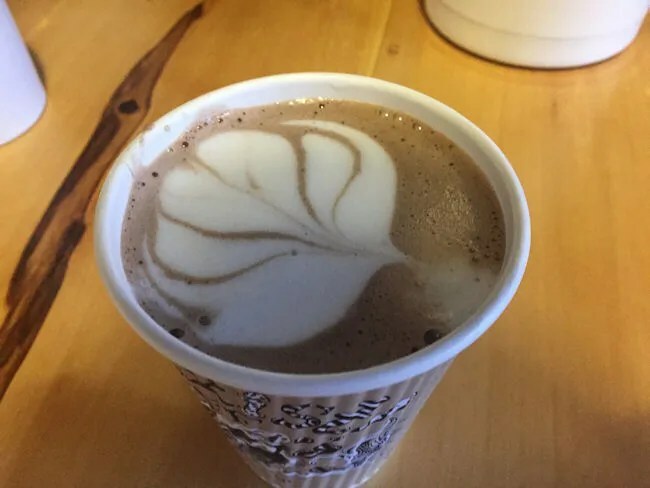 It’s a really rich, chocolatey drink that would be perfect for those cold winters walking to and from class. The food at Coexist consists of two categories of sandwiches. They have both hot and cold and all are under $7 a la carte. There is an option to add chips for a dollar. The one that sounded the best to me was The Roast. 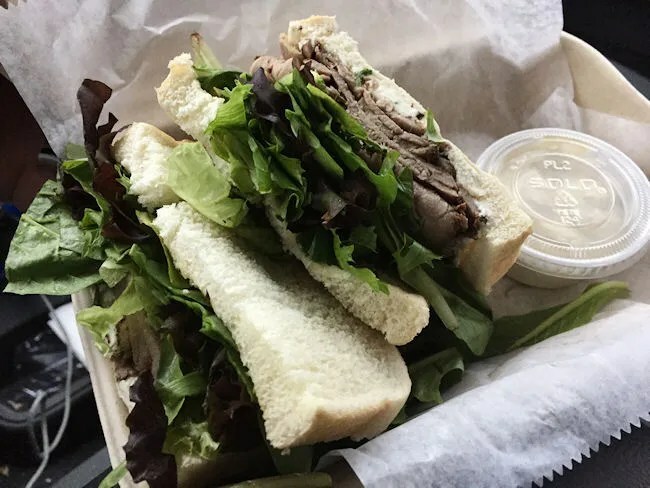 The sandwich is a large portion of sliced roast beef, greens, and a havarti cheese spread served on very soft white bread with a horseradish mayo served on the side. At first, the sandwich looks like a lot and if you like a lot of greens on your sandwich, it is, but I’m more of a meat and cheese guy. I cut the lettuce down to about half and really enjoyed this very flavorful sandwich on two very soft and fluffy slices of bread. I got my order to go, but most people seem to order their food and drinks and hang out for a while. 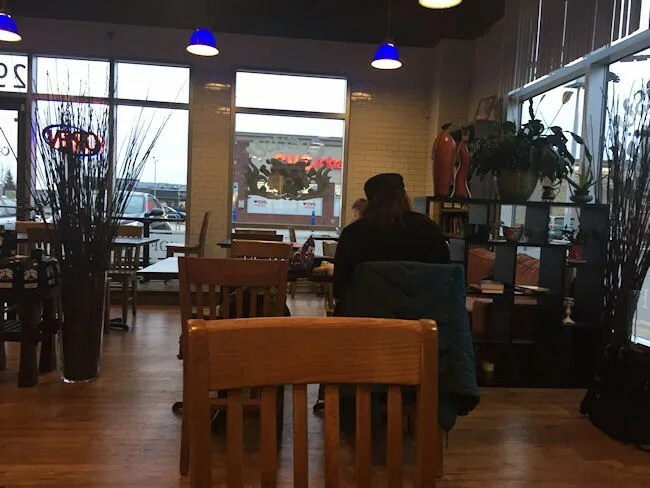 The space is comparable to a chain coffee shop except it’s much quieter….not library quiet, but no loud music blaring in the background either. Plus, they have desserts that are made at locally bakeries. 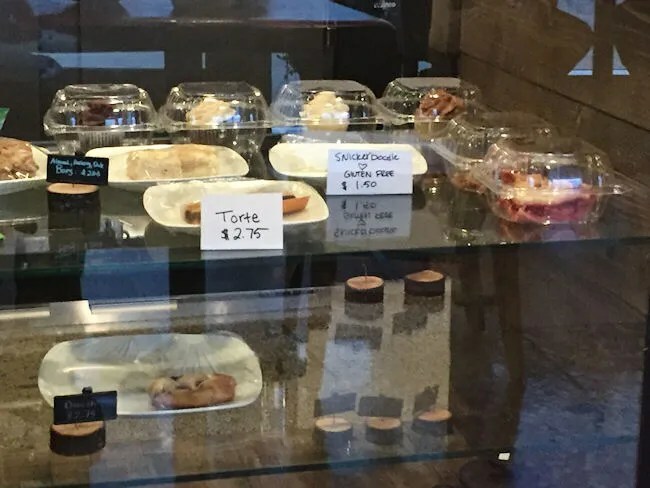 I see on their Facebook page they have gotten baked goods and sweets from both Sarkozy Bakery and Victorian Bakery in the past. Keeping with that local flavor, all of the coffee comes from Euphoria Coffee Company also in Kalamazoo. 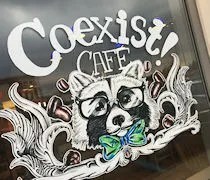 For people who like coffee shops, Coexist Cafe is going to be a great place for them. I really enjoyed my sandwich and enjoyed the experience, but I’m not a coffee drinker. The sandwich I had was delicious and tasted incredibly fresh. The hot chocolate was much better and richer than what I’ve gotten from competitors. The cost was a little over $10 and it was a very satisfying meal. The space they occupy hasn’t had a good track record since I’ve been in Kalamazoo, but here’s hoping Coexist figures it out and keeps providing a great space to enjoy a drink and get some work done.